Although most people opt for a romantic night out with their significant other on Valentine's Day, if you have a family or kids, it can be hard to find a babysitter or you may just want to spend that quality time as a family celebrating love. If you're trying to figure out Valentine's dinner ideas for your family, there is an option for your and family that is just as intimate and more unique. A Valentine's dinner idea for your family is a backyard Valentine dinner. Evenings, even during warmer months, can get a bit cold so make sure to create the perfect environment for your backyard Valentine dinner in the middle of winter in February. To make your backyard Valentine dinner a cozy and comfortable one, make sure you take advantage of using your outdoor fire pit. If you're using a wood burning fire pit, make sure you've got firewood prepared ahead of time. Not sure, what type of firewood to burn - check out this post. If you're using a gas fire pit, make sure you've got enough fuel so you don't run out in the middle of the evening. If you have a fire pit grill, this could also be the way you can prepare the Valentine's backyard dinner, but if you don't, you can just use your fire pit to create the perfect evening ambiance. If you have a fire pit grill, you can cook up a unique, delicious Valentine's backyard dinner from appetizers, to entree to the perfect toasty, grilled dessert. We've curated some of our favorite family friendly fire pit grill recipes for your Valentine's backyard dinner. Don't forge this simple, tasty grilled appetizer. Grilled pineapple is always a sweet treat and is family-friendly. We all know kids love grilled cheese so why not make this easy recipe that you can throw on your fire pit grill? Pasta dishes are always a tasty option that is family-friendly. To make your Valentine's backyard dinner extra tasty and unique, opt to grill the chicken for your chicken Alfredo. There are so many different types of grilled kabobs that you can make on the grill. You can prep these ahead of time and just throw them on your fire pit grill the night of your Valentine's backyard dinner. You can find a variety of grilled kabob recipes here. Grilled potatoes are always an easy and delicious meal side option, and kids love them too! 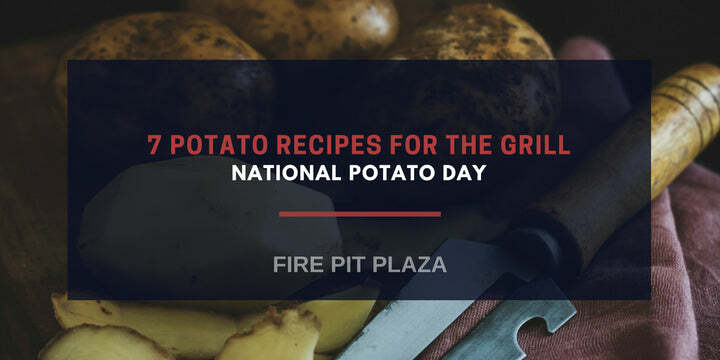 Check out some of our favorite potato recipes for the grill here. S'mores are always a family favorite around the campfire. Don't forget this delicious, chocolatey dessert for your Valentine's dinner with the family. Such an easy and delicious grilled recipe. Stuff a tortilla with some sweet ingredients and grill it and boom you have a dessert that the whole family will love! If you want a more laid-back Valentine's backyard dinner with the family, you can always opt for a campfire classic like hot dogs on a skewer and s'mores so you can really focus on spending quality together. We hope you and your family have a warm and toasty Valentine's Day backyard dinner!